Activision is putting you in the driver's seat to kill a bunch of other people in a vehicular combat tournament. Oh, and there are zombies, too. Killing zombies and demolition derbies are always fun activities on their own, so Activision is clearly hoping to come across a new chocolate & peanut butter combination with Blood Drive. The game is an action/driving title that seems like it might be trying to use shock value and sensationalism to take the place of quality and originality. 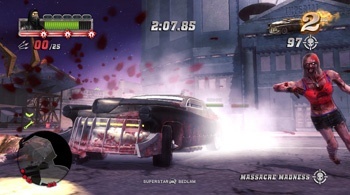 In Blood Drive, contestants must use their motorized death steeds of steel in a televised game show where drivers battle each other and hordes of revolting flesh eaters in an all-out fight to the death. Face undead frat boys, cops, strippers and bachelorette partiers, each with their own special brand of death and devastation - and ways to die! While these rotting monsters wander the streets of a desert sin city craving sweet, succulent brains, your enemies have come equipped battle hardened armed vehicles, including heavily weaponized muscle cars, hot rods, and more. Amidst this gore-drenched mayhem contestants must use their head or lose it! The game is set to feature six different environments, and drop-in/drop-out four-player multiplayer gameplay. However, details like the size of these environments, how many different types of tournaments there are, and what kind of single-player campaign will exist remains to be seen. Only a couple of screenshots have been released so far, and most of them predominately feature vehicular combat while showing very few zombies. This is the first time that Activision's said anything about the game (and the publisher has yet to put anything about it up on its web site), which is a little worrisome since it's due to be released for the 360 and PS3 in November for $49.99. Obviously, it's going to be rated "M" for Mature, but I'm not sure that mature gamers are going to be the ones who end up enjoying it.